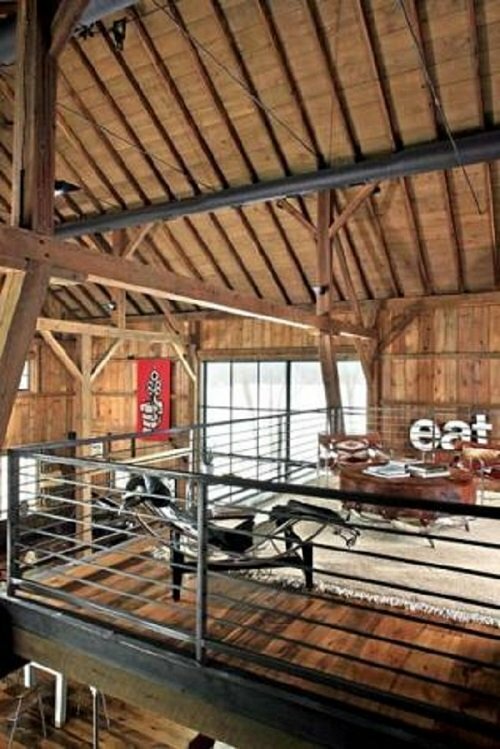 Converting a Barn into a House – this article will show you how to make that dream come true. To start, you’ll need to put a new foundation under your new/old barn home ($5,000-$8,000). Then you’ll need interior framing to shore up old walls and trusses ($7-$16 per square foot), drywall ($20-$30 per linear foot) and finally, a new shake shingle roof ($16,000-$27,000). It can add up. But is it cheaper than building a true barndominium or post and beam barn home? 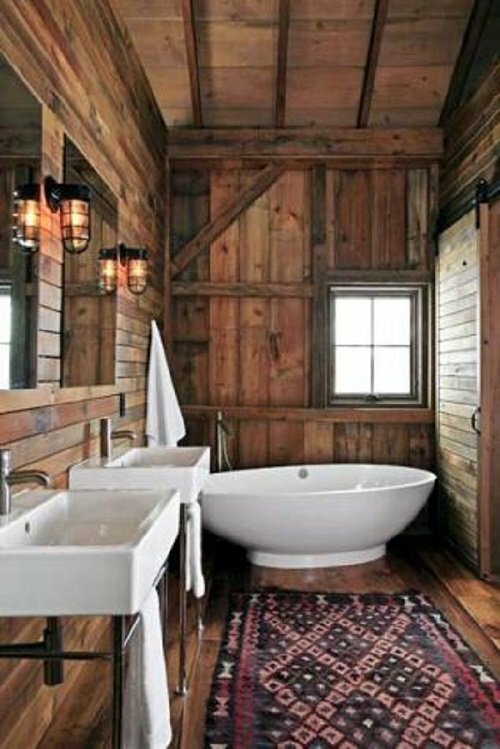 And is it worth it in the long run, to make your dream of living in a barn true? It can be. Read on. Converting a barn into a house? How did this idea take hold? No one can pinpoint with any accuracy how the term “barndominium” was born. 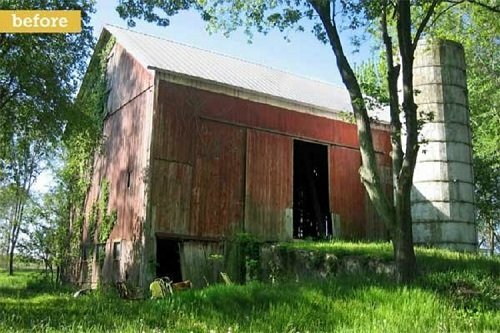 We know for sure that it is an unlikely marriage between two disparate terms; barn and condominium. That’s when they converted an old gambrel-roofed farmhouse into a barndo with a rapt TV audience worldwide watching. Here’s a bit of trivia regarding their famous barndominium, shown here. 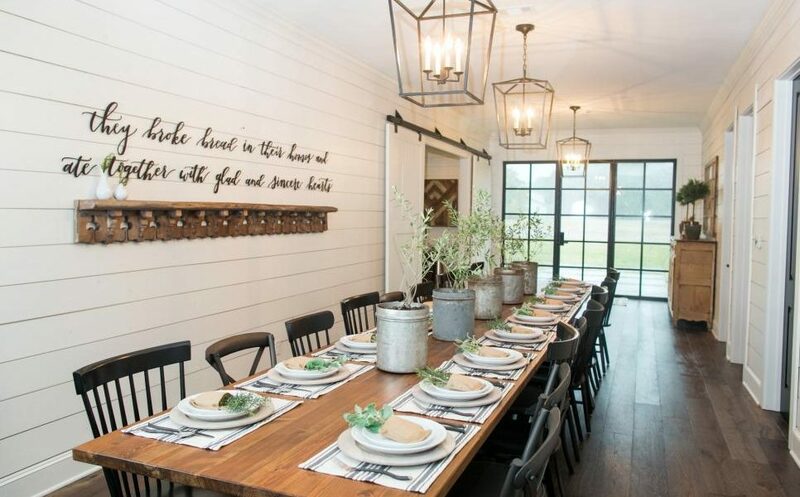 According to some who have been through it, the elongated dining room with its huge farmhands table is actually on the second floor. An interesting design choice. We wonder if the kitchen is up there, too? Oddly enough, Texas, which is where the Fixer Upper barndo was featured, has without a doubt the highest concentration of barndominiums anywhere in the country. More than 190 were for sale in Texas when we checked recently on Zillow. So, not only are a lot of people interested in building them lately, there is quite a resale market for them as well. If you’re one of them, with a yen to have your kids literally make the old adage of “Did you grow up in a barn?” come true, then this article will answer most – if not all – of your questions. 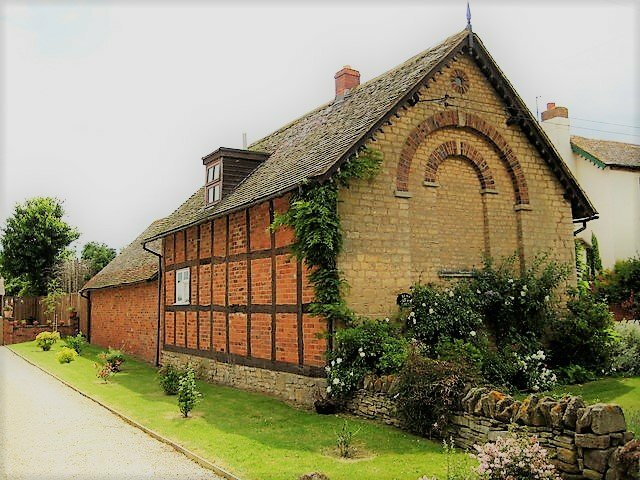 According to an interview in This Old House, when art gallery owner Judith Racht acquired a lovely old farm in Niles, Michigan, 25 years ago, she knew the house was a bore. But the romantic-looking barn out back? “I always had this idea I was going to do something with it,” she says. She began planning and then brought architect Austin DePree on board. “He really put my ideas on paper,” she says. 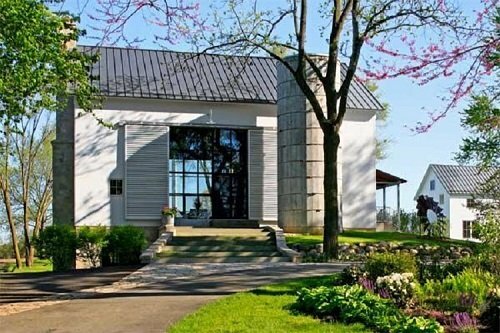 The architect transformed the barn door openings into awe-inspiring works of metal and glass. and he harnessed the geothermal power of the earth by putting channels right into the floor to catch condensation. The innovative young architect then forestalled the possible issue of too much snow on a new zinc roof by reinforcing collar ties with steel tension rods. Then, the renovation team lined the original post and beam frame with reclaimed barn wood to create the stunning dining area shown below. 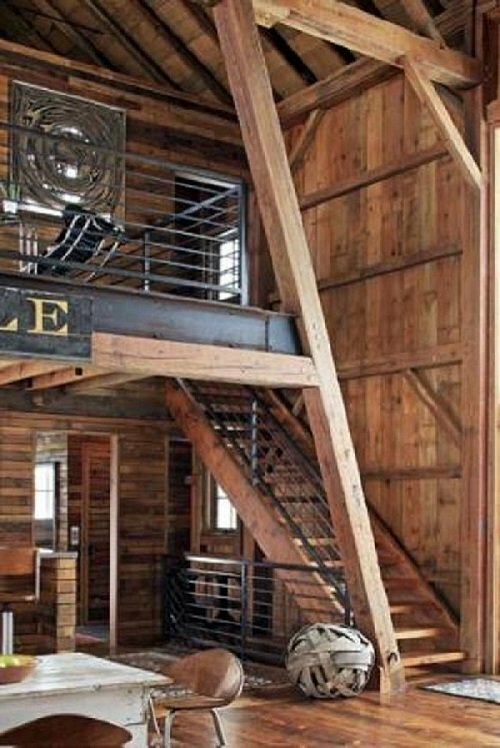 Modern day masons joined with metal workers and and structural engineers to combine the barn’s old elements with new purposes. For example, they repurposed on old support beam — once used to allow wagons enough room to turn around inside the big structure — with one made of strong metal. And the result is artful. The master bedroom hovers over the kitchen now, mimicking a hayloft. 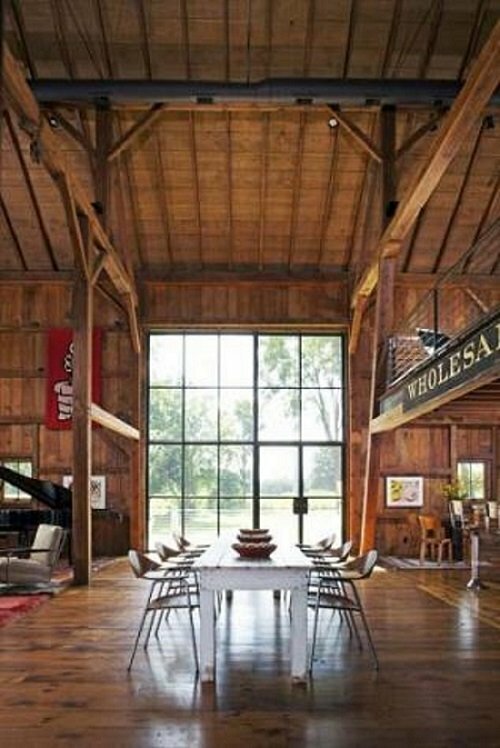 The entire barn home now positively glows with reminiscences of old combined artfully with the 21st century. And the result of Judith’s vision couldn’t make her happier. Ensley Caldwell is full of advice and arcane statistics on the subject of big barns turned into homes. According to Caldwell, speaking in an article in the online critical blog TheBestPickReports.com, renovating an old barn will probably be cheaper than building a whole new one. But it may also get in the way of just how much you can renovate. “But the physical structure is already there, which saves you money,” he adds. The really good news? 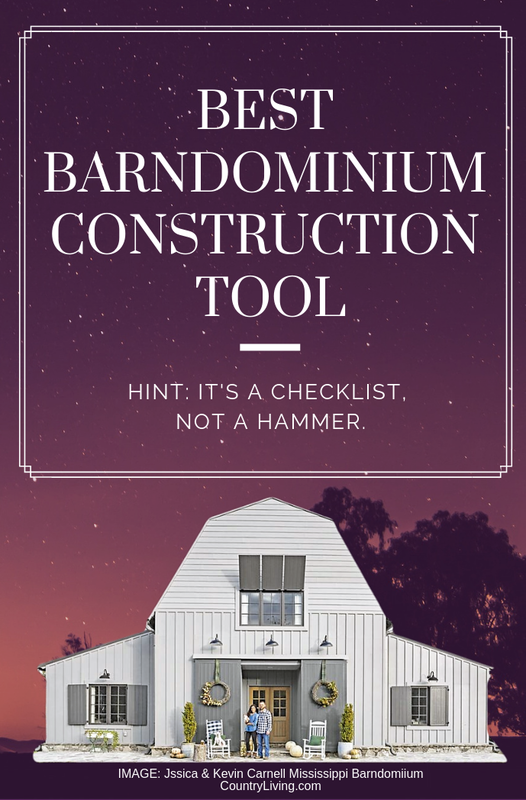 It will probably cost much less than building a new barndo from scratch. For one thing, the physical structure is already there. But it will need a few things you would have had to supply with a new barndo anyway. For instance, you’ll need to put a new foundation under your new/old barn home ($5,000-$8,000). Then you’ll need interior framing to shore up old walls and trusses ($7-$16 per square foot), drywall ($20-$30 per linear foot) and finally, a new shake shingle roof ($16,000-$27,000). It can add up. But probably not to the extent new construction would entail.